This Magazine → Why isn’t child care affordable for all Canadians yet? Why isn’t child care affordable for all Canadians yet? 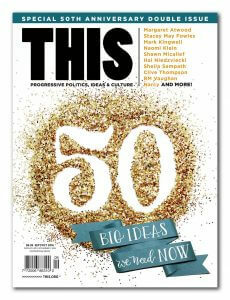 For our special 50th anniversary issue, Canada’s brightest, boldest, and most rebellious thinkers, doers, and creators share their best big ideas. Through ideas macro and micro, radical and everyday, we present 50 essays, think pieces, and calls to action. Picture: plans for sustainable food systems, radical legislation, revolutionary health care, a greener planet, Indigenous self-government, vibrant cities, safe spaces, peaceful collaboration, and more—we encouraged our writers to dream big, to hope, and to courageously share their ideas and wish lists for our collective better future. Here’s to another 50 years! As I sat down to write this, I found myself thinking about the many aspects of child care that matter to me—from my abhorrence of the trend to “schoolify” very young children to my deep belief that child care should be an affordable not-for-profit publicly supported service. But my overall frustration is that for nearly five decades, politicians of all stripes have used child care to gain political points during both federal and provincial election campaigns but so far none of our governments, except Quebec, have been brave enough to comprehensively address the matter. Since 1970, when the Royal Commission on the Status of Women proposed a national day-care act, it has been a two-steps-forward, one-step-back dance. On International Women’s Day in 1986 Brian Mulroney’s Conservative government released the “Report of the Task Force on Child Care.” That report, initiated by the previous Liberal government, called for “a universal system of child care, co-funded by federal and provincial governments.” It recommended a system of nonprofit services, designed and managed by the provinces, guided by national standards. The system would be affordable and enhanced through a gradual increase in supply until 2001 when it would serve all children. But alas, instead of acting on the report’s fine recommendations, the same Conservative government set up its own task force on child care and a year later issued “Sharing the Responsibility.” The report recommended tax breaks for parents, grants to for-profit centres, and business incentives to create workplace child care. This set the stage for the ideological shift from funding service providers to funding consumers and from a vision of child care as a community service to child care as a business. Through the 1990s child care was off the national political agenda. It returned in 2003 when a national child care program came closest to reality under Paul Martin’s federal Liberal Party government. In 2004, Martin said he would make good on a pledge for national child care program worth $5 billion over five years and by late 2005, Social Development Minister Ken Dryden had finessed bilateral agreements with 10 provinces based on quality, universality, and accessibility, all through a developmental focus. Unfortunately, many steps back followed all this forward movement. The Liberals lost the election in January 2006. One of the first things Stephen Harper’s new government did was terminate the bilateral agreements and “replace” them with a new taxable monthly allowance of $100 for children under six, disingenuously called the Universal Child Care Benefit (at best it paid for one or two days of child care a month). Our work must be tireless. All of us must put the pressure on. We must tell our political representatives, both federal and provincial, that children, women, families, communities, and the economy will all benefit when we have a system of quality affordable child care across the country—and that won’t happen through commercial big-box services. In B.C. we are ready with a plan for public investment into a system of child care that will provide; affordable access for families, fees set at no more than $10 a day, more high-quality spaces for children, and better wages for early childhood educators. Any first steps taken towards delivering affordable, high-quality, flexible, and fully inclusive child care must be taken within the context of that B.C. Plan. We don’t want—or need—false solutions. Tax transfers to families are useful—I gratefully accepted my baby bonus years ago—but tax transfers do not build child care services or make them affordable. We must not let history repeat itself. Instead, let us work to ensure our next steps are a foundation for a public system of integrated care and learning. Mab Oloman’s interest in child care emerged when she became a parent in 1976. Mab thought it would all be fixed by the time she became a granny, but today the child care crisis is even more desperate.